Home / Blog / Healthcare Professionals / Does your bed go this low? Does your bed go this low? • Falls Risk: Floor level height with optional safety mat and advanced falls alarm system to help facilities manage high risk resident falls. 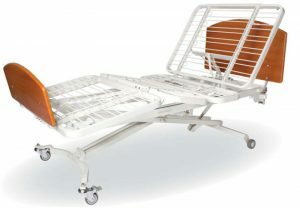 • Bariatric Dignity: Provide bariatric residents the same equipment utilized throughout your facility. • Custodial Care: Enhance resident comfort (expandable width) and height (up to 30″) to manage custodial residents needs. • Short Term Rehab: Advanced positioning features (Cardiac Chair, Trendelenburg, Reverse Trendelenburg), optional scale to manage higher acuity residents. 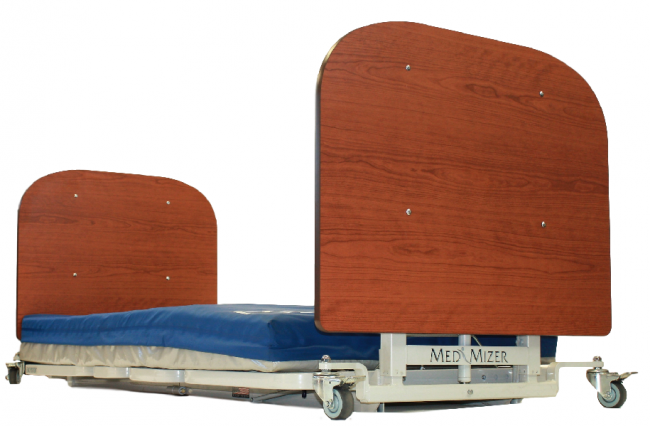 • Standardization: Improve staff training as well as maintenance with ONE bed-frame solution across your facility. Now you don’t have to choose between safety, quality, and budget. Best of all, everything comes from the same trusted source and is made in the USA. The bed is just wonderful, especially with this mattress. I am sleeping great again, despite being much sicker now and more pain–recovering slowly from 9 weeks of the destructive basic bed I had. The bed works great, looks nice, and allows much greater comfort with 3-platform design. The retractable feature is really useful for table access, and when furniture is moved into room, gives me best access.